Love the idea! Ya gotta do it. Decor via stamps. Awesome. And I had no idea about vectoring! Oh and, well, there are no words for how I feel about that new color! As you know, my bedroom in my old apartment in Dupont Circle was something very similar and I still love it! So I wanted to update everyone on my first yoga class. That's right, I am really doing this! As you know, I purchased a month of unlimited yoga at a local studio. The studio itself offered tons of different types of beginners classes, so it seemed perfect to me. I am a bit of a gym rat, so one question I have been asked is: why not just take yoga classes at the gym? I thought about that, and hope to do so after the month is over. However, I think it is important for me to learn the basic poses from an actual yoga studio to avoid injury. After the month is over, perhaps I'll have enough skillz to try out my gym's offerings. Since I first posted about yoga, a lot of friends have sent me this article. I think its fascinating, and also can be applied to almost all sorts of physical activity these days when thought about broadly (definitely my preferred form, running). A friend from high school who is now a yoga instructor also linked this response on Facebook. I am going to try yoga nonetheless and just check in with my body and see how its going. Ok, so fast forward to my first class. I was really nervous. Not about doing yoga, I am not that competitive and knew I wouldn't be great at it to start, but more about walking into the culture of a "yoga studio" by myself and walking up to the desk to tell them I have no idea what I am doing. Luckily they were super nice and told me where to put my shoes so I didn't just copy everyone and feel like I was on candid camera. Overall verdict: it was great. My class was "Gentle Yoga - 1" and recommended for first timers. The class was very slow--we just did some basic modified poses in a very deliberate and mindful way. And then laid on the ground in the dark for a while and listened to new age music. The instructor was great and walked around the entire time giving individual pointers. I took this as a great sign and listened to everything she had to say, especially when she was talking to me! Not to get yoga on you, but she talked about how one way to look at it is to try to find the balance between effort/trying and allowing for peace/relaxation. Good metaphor for life, don't you think? 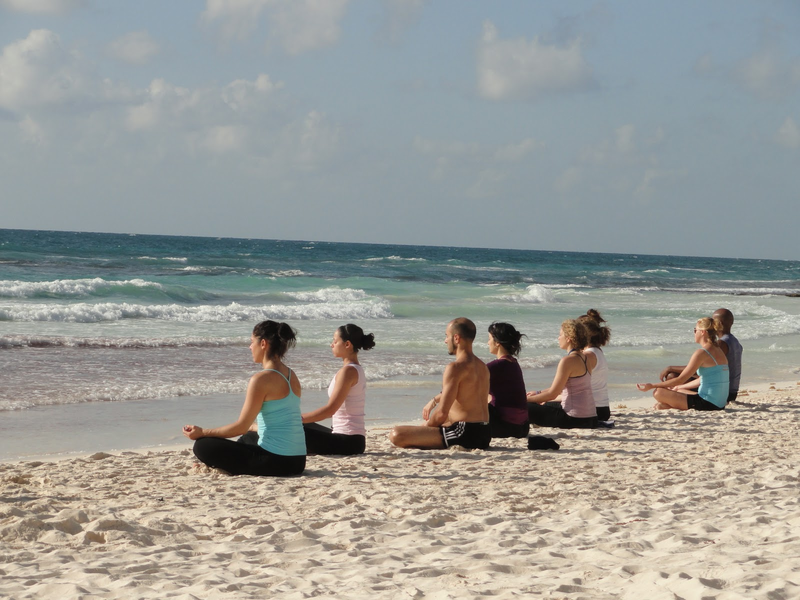 Yoga in Tulum, Mexico, a popular yoga retreat destination and where I honeymooned. Source. The biggest take away I've had is how nice it is to give your mind a break from the craziness and also get a work out at the same time! Let's just say the gym environment isn't very calming. I felt like I was getting a two for one deal on therapy and a workout! So it continues! "Yoga Basic" is tonight. I'll keep you posted. So far so great. 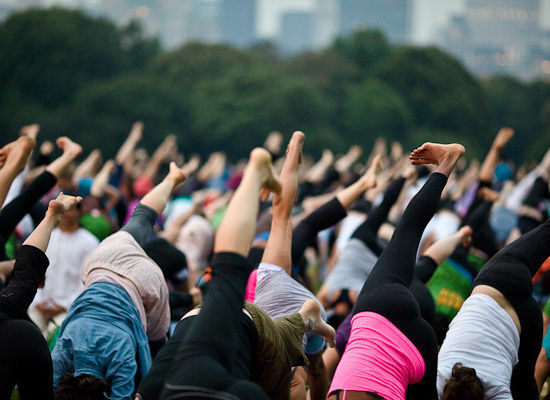 PS: Check out Deweese's post on yoga, here! PPS: Also check out the yoga adventures of our friends over at the Kathmandou! Great reads! I enjoyed reading your first yoga class experienced, yoga and practice the morning before breakfast when the mind is calm and fresh and the movements can be done with ease and vitality is good for your mental and physical fitness and health .